The Artifitincturling is a dye-based lifeform. It resembles an equine, mostly a unicorn. It has white fur all around save for the mane, beard, and the underbelly. Silky and soft to the touch, the Borderling's fur leaves no residue. A single, colorful horn spirals up between its eyes. 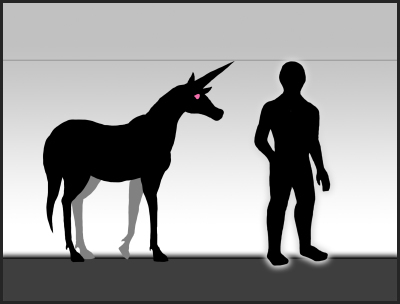 After transformation, horns of many colors jut out from the Artifitincturling's back, eyes, and face. They always spiral upwards from the Borderling's body. Their tips are incredibly sharp and can pierce through soft tissue. There is a narrow, fleshy tube inside each horn. Inside each delicate tube are differently colored dyes. The substances are similar in molecular structure to that of Earth's synthetic dyes. A light-pink goo erupts from the small openings between the Artifitincturling's skin and its horns. It is thick in consistency and drips to the ground in smooth globs. Some Artifitincturlings grow geometric shapes on their backs and heads in a similar fashion to a Plastic Borderling infection. The Artifitincturling levitates 6ft off the ground. It can ascend and descend at will but doesn't go beyond 2ft and 7ft. 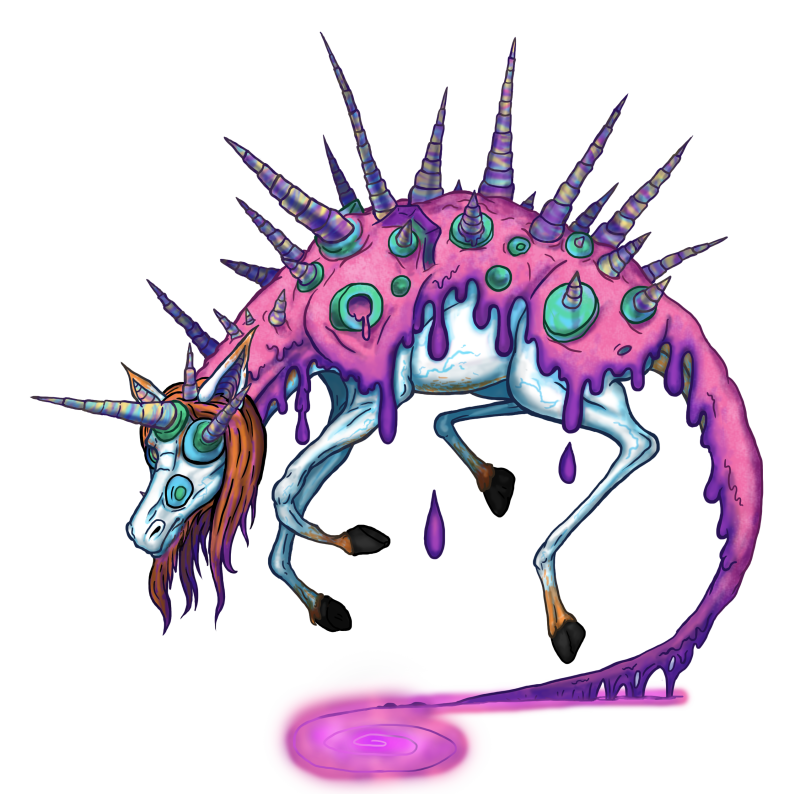 Inside the Artifitincturling's body is the same pink ooze that dribbles from its body. Its consistency is less similar to wet paste and more like fluid. When exposed to oxygen, the substance coagulates within seconds. In its dormant form, the Artifitincturling speech's consists of neighs and grunts. However, the Borderling loses the ability to speak after transforming. The Borderling has a strong odor similar to modeling clay. It is salty and musty with a hint of an acrid scent. An impure Artifitincturling is more desaturated than their healthier counterparts. Some of the corrupted Borderlings display little to no color. Its joints are weak in some places. Its hooves and bottom jaw are seen hanging on fleshy membranes. The Artifitincturling appears in or around places that produce artificial dyes. Factories and shops will have a chance of having an Artifitincturling visiting them. It travels to and from our dimension leaking out of synthetically dyed objects. Food, clothing, and toys will generate fluids from their surfaces. Each stream has a different color. The fluids snake into one spot and form a puddle that's 7ft in diameter. The puddle begins to congeal soon afterward, forming a beautiful unicorn lying on the ground. It gains its footing and begins to explore its surroundings. Shortly afterward, it will suddenly act differently. The Borderling will go limp and levitates off the ground. Horns will violently erupt out of its head and body. This transmutation forces dye to splatter in random locations, infecting anything they touch. The Artifitincturling exits our world after finding another store or factory that has dye. It begins to break down and melt, reversing the process of manifestation. Its hooves and legs will droop and fall apart. Its head will disfigure, jaw becoming unhinged soon after. Its torso will collapse, spilling gallons of dye on the ground below. Lastly, the spikes and spine fall into the pool below. Minutes after the gruesome sight, the puddle shrinks in radius into there's nothing left. The Artifitincturling's disposition is reminiscent of a horse's. It is mild is can be easily startled. After its transformation, the Borderling acts inanimate. Without any visible emotions, it behaves similarly to that of an internal organ than an animal. It floats at a moderate speed of 5 feet per second. When near items of interest, its limbs erratically twitch. These involuntary twitches are minuscule at first. The closer the Borderling gets to the object of interest, the more prominent the spasms become. The Artifitincturling feeds off the dye it generates. After pricking an object with its horns, it waits patiently, albeit the random muscle spasms. Once after substance exceeds over 2 gallons, the Borderling begins to feed. In a similar fashion to a needle, it uses its horns to absorb the dye. The colorful concoction flows directly to the stomach cavity. An impure Artifitincturling is greedy and also gluttonous. It devours more than 4 gallons during its visit, leaving more casualties in its wake. It fights other Artifitincturlings while they drink their precious fluids. When near another Artifitincturling, they ram their horns into the others flesh. While the healthier Artifitincturling tries to pull itself free, the other drinks its stomach contents with unseen glee. As the result of overeating, the stomach lining will eventually tear. Colorful fluid will spill out below it with a splash. With its stomach busted open, the impure Artifitincturling can't eat. Therefore, it will eventually starve to death. Exposure to the Artifitincturling's Effect radius generates a small pinprick of dye. The stains won't grow until the Borderling touches them with its horns. When a Witness is within range of the Artifitincturling's Effect Radius, they will generate dye from the inside-out. Internal organs will show specks of vibrant colors. The stains will soon bleed out into the skin. Lastly, their bodily fluids will take on multiple hues. When a person bleeds or sheds tears, it will appear to look like paint leaking out in smooth streams. At this point, all life functions cease to function. The Witness is now a large puddle of synthetic dyes. After the Artifitincturling exits the human world, all the dyes will fade away, changing everything back to the way it was before the Borderling's visitation. Casualties won't replenish after an incident. Limbs lost during the transmutation won't regenerate.